National Blog Posting Month – Day 19. Madge is a fan of mid-century modern architecture. 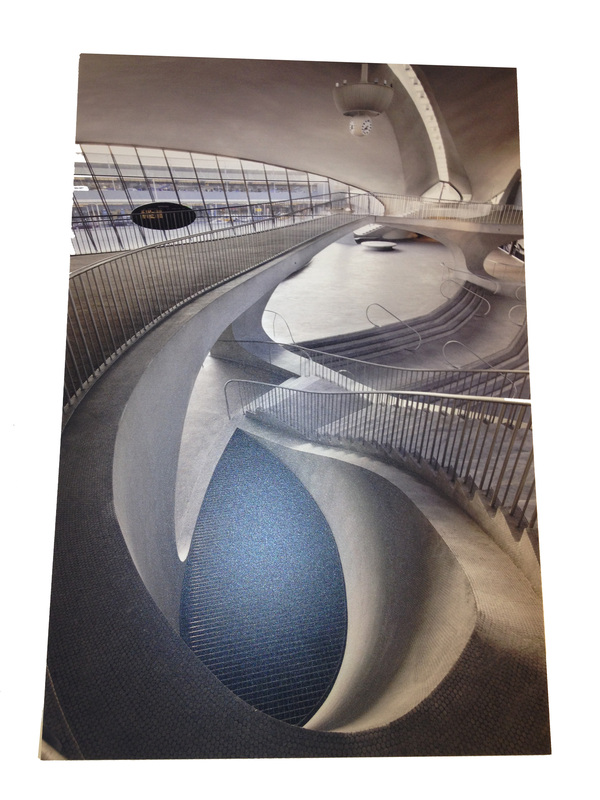 One of her favorite architects of that era is Finnish-born Eero Saarinen. Though he died relatively young, Saarinen is responsible for some of the most iconic buildings of the 20th century. 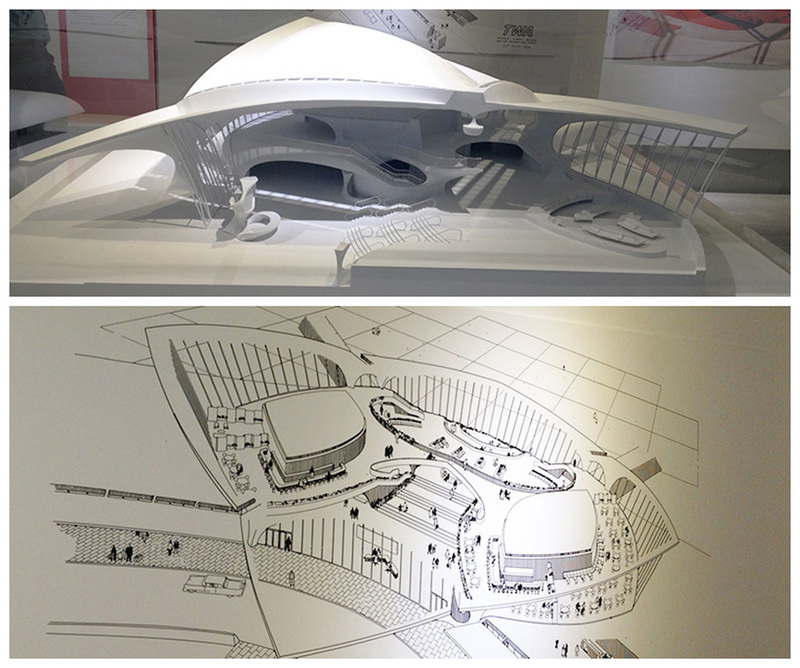 Last year, Madge was fortunate to take in a retrospective of his work at the Museum of Design in Atlanta (MODA) and it was an incredible experience to see so many plans, scale models and photographs of his designs. Unlike modern architects who emerged from the Bauhaus movement, creating the angular International Style, Eero was all about the curve and many of his buildings have a sensuousness unlike any other architect. Born in Finland, Eero was the son of another prominent Finnish architect, Eliel Saarinen. In 1923 the elder Saarinen moved his family to the United States. He designed the Cranbrook Academy of Fine Arts located in Bloomfield Hills, outside of Detroit, in 1932. He then became the head of the school and also member of the faculty. 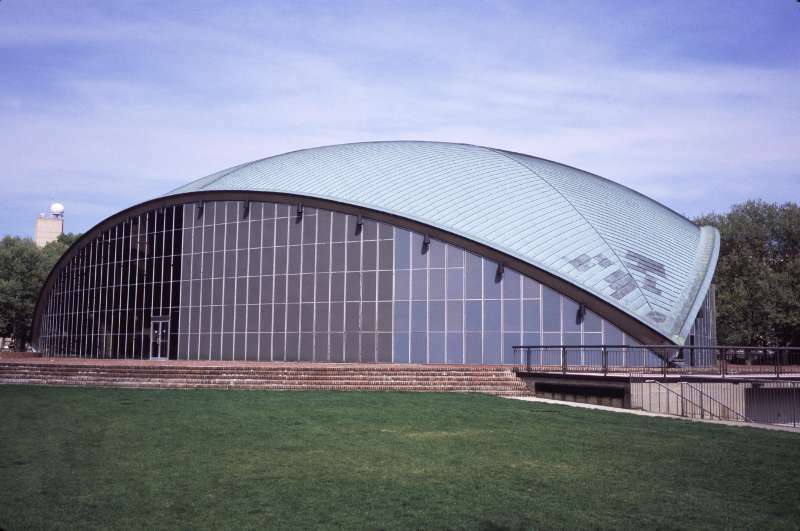 Cranbrook was a hotbed of modern design and Eero grew up in that environment, took classes and befriended fellow students Charles and Ray Eames. Eero went on to earn a degree in architecture from Yale and then joined his father on the faculty of Cranbrook. 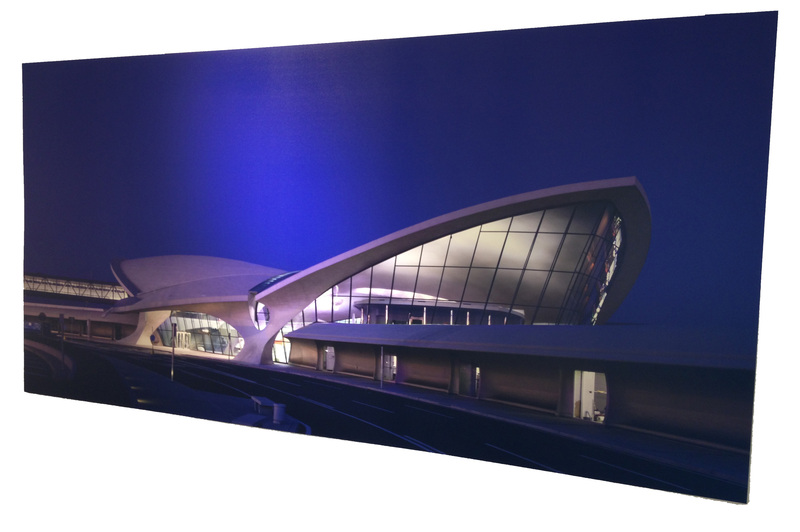 While still in school at Yale, Eero was invited by industrial designer Norman Bel Geddes to work on the General Motors Futurama Pavilion for the 1939 Worlds Fair in New York City. Madge visited a Bel Geddes exhibit in Austin several years ago. 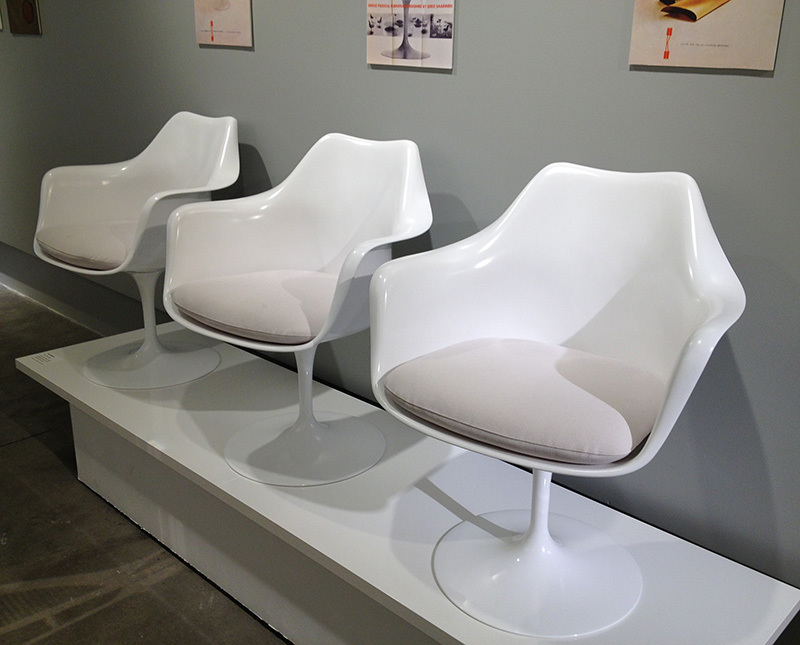 Eero first received major attention for a chair he co-designed with Charles Eames while still working with his father. Known as the tulip chair it is still manufactured by the Knoll company. 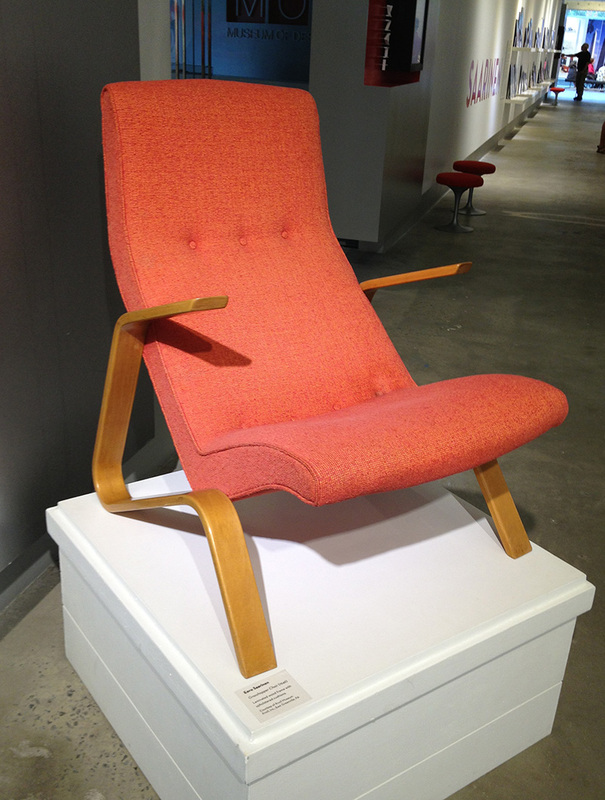 His long association with Knoll produced many other iconic pieces, also still in production, including the womb chair and the Grasshopper lounge chair. Eero founded his own firm in 1950 after the death of his father. His first major commission was for the General Motors Technical Center in Warren, Michigan in 1956. The multi-building campus was constructed of steel and glass with exterior brick accent walls of burnt orange and bright blue. 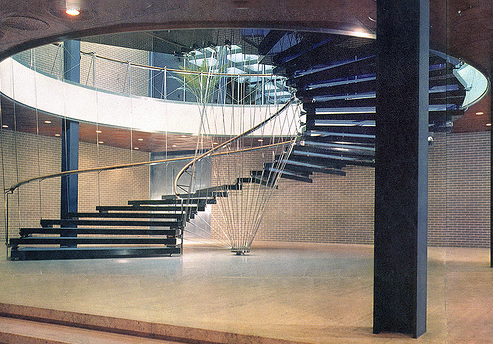 The Design Center building is famous for it’s center spiral staircase. The entire campus was listed on the National Register of Historic Places in 2000 and designated a National Landmark in 2014. After the national acclaim of this design, Eero went on to design many other corporate campuses. Two of his most intriguing designs were ones I was unfamiliar with. One was the Ingalls Ice Ring at Yale. 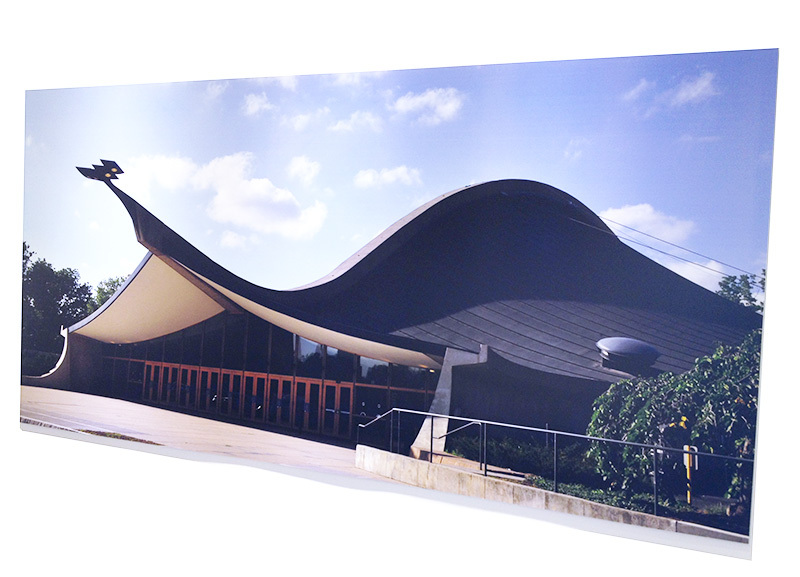 Its undulating design and arching fin have earned it the nickname “The Whale”. The second was another building at MIT, the non-denominational chapel. 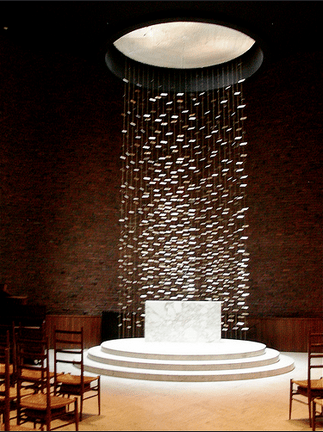 A simple, windowless brick cylinder whose focal point is a stunning metal sculpture by Harry Bertoia hanging from the circular skylight down to a small, unadorned marble altar. His three most best known structures were a major presence at this exhibit. 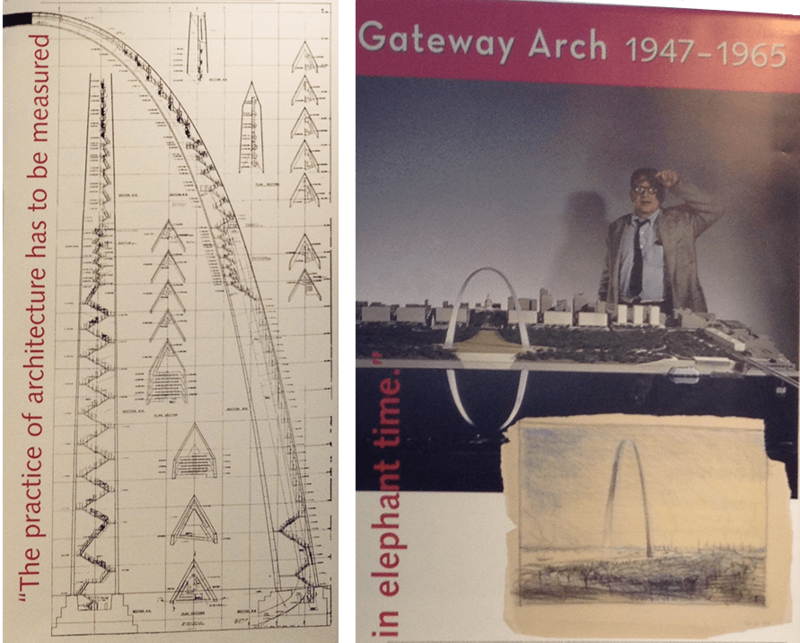 The TWA Flight Center at JFK Airport and the main terminal at Dulles Airport in Washington DC, both of which opened in 1962 plus the Gateway Arch in St. Louis, first designed by Eero in 1947, but not completed until 1965 due to funding issues. 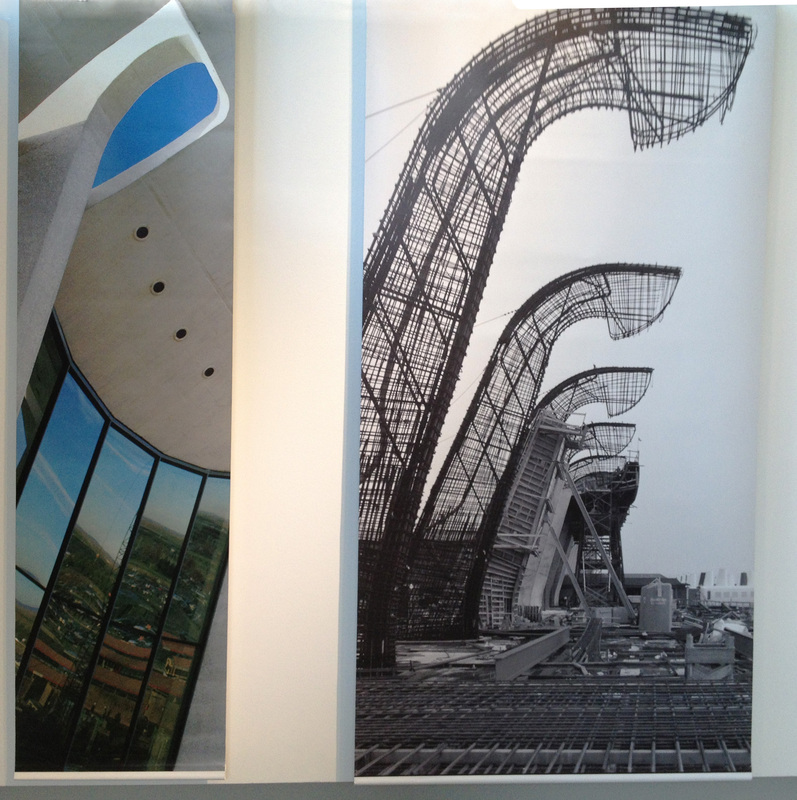 The most striking images of the exhibit were in the section covering Dulles. Two photographs placed side-by-side. One showing the metal structure of the support columns, the other a completed poured concrete column. It was sculpture in the purest sense. 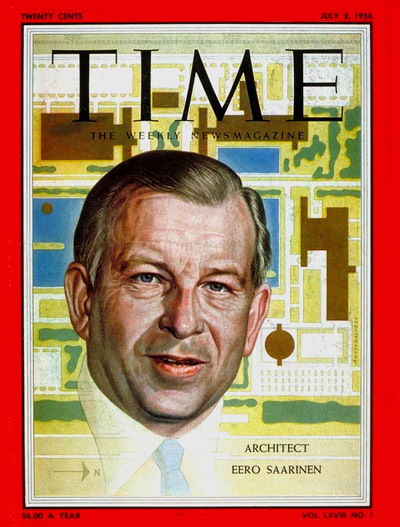 Eero Saarinen died in 1961 while undergoing an operation for a brain tumor at the far too young age of 51. His remaining projects, including the Arch were completed by partners at his firm. It’s appropriate that one of the last finished projects was the Gateway Arch. When Eero won the competition, the Arch commission mistakenly thought it was the father, Eliel, who had submitted the design. Upon hearing the news, the family opened a bottle of champagne to celebrate. Within two hours word came that it was in fact Eero’s design, a catenary curve, meaning a curve in the shape of a free-hanging chain, that had been selected. What else was there to do? The father opened a second bottle to toast his son’s success.